The Ridgeway is arguably the oldest road in Britain, well, being local, we reckon the Icknield Way is more likely! I have lived with both all me life as they run through Wendover. They are one of the same (nearly). Step out the Swan’s front door and you are walking on them. Ancient history underfoot. We’ve used bits of them for years. To get up the Monument, move farm machinery and livestock, take a stroll up to The Café in the Woods or over to Godfrey’s. Bits of it are known more by more local names such Daniel’s Trudge and Hogtrough Lane. They are marked by burial mounds Grims Dyke, hillforts and earthworks of unknown age or use. Truth be told we to refer to 'The Icknield Way' more, parts of which the modern interpretation of ‘The Ridgeway’ uses. Its the Upper Icknield Way that is responsible for the dog-leg that is Wendover’s main road. The main thoroughfare was once down from Halton, up the High Street, along Pound Street over the railway ( a recent addition!) and away to Princes Risborough. 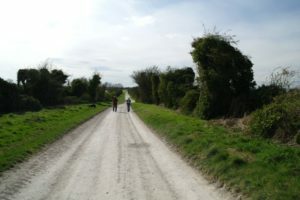 The modern road to London and Aylesbury were but tracks off of it. There is The Lower Icknield Way as well and this really demonstrates that the actual route of these ancient tracks depended very much on the ground conditions. 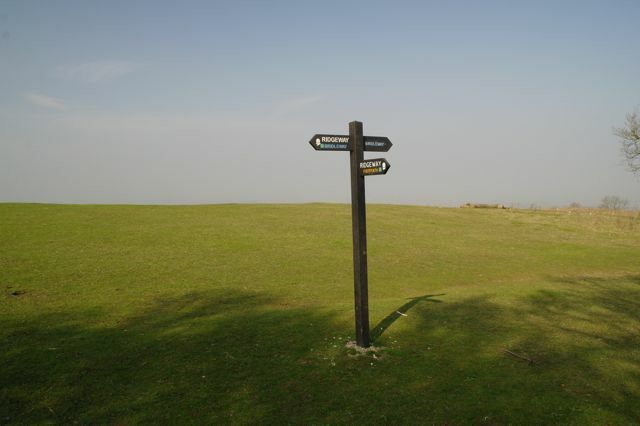 Convention says you walk it from The Sanctuary, or Overton Hill, on the A4 in Wiltshire to Ivinghoe Beacon in Buckinghamshire, an official distance of 85-87 miles depending. One Pork Pie Friday we were discussing the Icknield Way, flint axes, history of the High Street and the modern Ridgeway, as you do, when the suggestion was made that we really ought to walk it. Stewpot had walked it in stages a number of times and Godders had done bits and bobs. I had it in mind that a section every weekend would be nice but a few ales later it was decided we’d do the whole lot in one hit. We agreed there was no point walking back to Ivinghoe Beacon as we would most likely knock it on the head at Wendover, or Godders’ house which is only a spit off of it, so we agreed the walk would be a pilgrimage to Avebury. Great! Within a couple of weeks Stewart had devised a schedule, Godfrey had sorted accommodation, the pair of them had done a recce of the ‘places to stay’ and I’d sorted the logistics, as I patently didn’t want to be carrying much and had chat to the fairy tree to sort the weather. The start date was set for Monday 27th March 2017 and somewhere along the way Simon the Telly expressed a wish to join us for the first stage. First night would be spent back home and that, as they say, was that. All done and dusted. Two daft things happened. Nick decided we should set off at 07.30 to beat the morning traffic and a couple of days previously Polly had ripped a claw out and was still rather lame so would have to sit this one out. 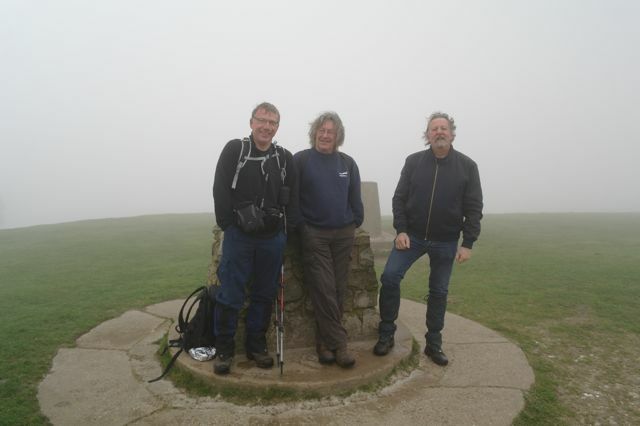 Jane dropped us at Ivinghoe Beacon in very chilly foggy conditions. Polly looked dejectedly out the window as she drove off (Jane not Polly). Now you have to walk to the start then walk back unless you want to climb a 1:2 slope. We did ask Nick why we had left so early but he was away, click clicking his sticks. As we approached Tring in the murk, bands of sunlight started to break through and things were looking up. On any other day the views would have been lovely. At Tring Station there is a fine coffee van. As an occasional commuter Nick is well-known to the owners and we had a nice chat with them and enjoyed a fine cuppa before setting off to cross the A41 Tring by-pass on a high sweeping bridge that I’ve driven under many a time not realising what its purpose was. I now it as the Ridgeway Bridge! Now considering Simon doesn’t do a lot of walking, apart from through London to work and a mile and a half home each evening (uphill), and weighs in at about five stone he was doing well. Nick of course was like a metronome and doing 3.4 mph according to his instrument pack. Stuart and I just sort of got into the swing of it. Wasn’t as bad as I’d thought it would be. It helped that this was all familiar ground to us and the distances tangible. Somehow, suddenly we were coming down into Wendover bathed in sunshine and, blow me down, it was only about midday! The Swan was barely open so after a quick ‘Hello’ to Paul, the Tallest Man in Wendover, we ceremoniously stepped out into the High Street and settled down outside Rumsey’s the Chocolate Shop joined by Alice, Jane and a small child or two. We looked like hikers except to the locals who asked what we were doing with rucksacks. We told them we were off to Avebury whereupon they said “See you later then.” and went on their ways various. Village life! Coffees finished we were off again to climb Coombe Hill, taking in the views on the way then dropping down through the PM’s Chequers country estate, keeping strictly to the footpath where Simon declared he was nigh on done for but we rallied round and shouted back suitable encouragement, until he was out of sight, pressing on to Grangelands and finally down into Happy Valley and The Plough…which was shut! Jane turned up bang on cue and within 10 minutes we were seated happily in The Swan celebrating a very successful first day. We propped a cushion behind Simon’s head and brought his pint to the upright position lest he spill it. He was smiling one of those contented fulfilled smiles and so were we. The logistics for the morning were a bit more complicated but all was going to plan so we all went home for tea, eventually. All our stuff for the week was packed and ready. Nick’s missus Janice brought Nick and Stewart over to Wendover, dropped their kit off for the remaining week and took the three of us plus Polly, who was now only vaguely lame, over to the Plough (closed) at Cadsden. 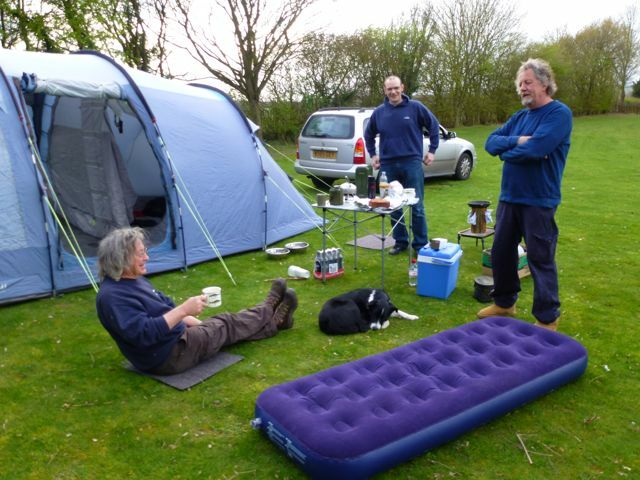 Paul would collect all the kit later and deliver it to Watlington and, bless him, set up camp for us. 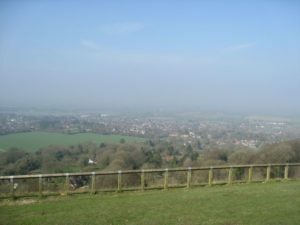 The climb up to the Whiteleaf Cross above Princes Risborough is quite dramatic and not really what we wanted first thing in the morning. As it happened we nearly didn’t as we were so busy nattering away we wandered off down another path so had to execute a sharp left up an even steeper climb! Local knowledge! Although a bit on the nippy side it was a bright day with rain forecast later and from here, off to our left, we could see almost all the way to our destination, or so we imagined. What was on the agenda was a detour to the Lions at Bledlow for a swiftly so onwards we went. The walk back down to the Wycombe side of Risboro’ and crossing the Wycombe road down to AJ’s house, the path across the ploughed field resembling a swamp, isn’t that inspiring but once through his garden, yes really, across the field at the back and over the now Marylebone Birmingham down line by a crossing, here on two levels as it was originally a single broad-gauge track (just so you know). 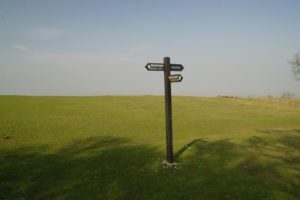 Then it was across the balloon friendly golf course and the long climb up the to the old Neolithic site and Iron Age settlement of Lodge Hill before heading down to cross one of the most spectacular fields in Bucks before dropping down into Bledlow where the ‘Incident with Rabbit occurred’. I won’t go into much detail but it did involve a myxy rabbit, Nick wanting to put it out of its misery and Stewart’s misplaced boot. Fortunately we were just round the corner from the pub so Stuart and I sat outside while Nick retreated to the Gents to clean himself up. As he smelt of rabbit we sat away from him while he enjoyed, or not, his pint. Polly had a well earned snooze. A change of clothes was arranged for the evening and pints downed, but it was in a quieter mood we sallied forth, Nick out in front. The next bit involved walking between the disused very deep quarries of the old cement works at Chinnor. Also in the category of 'not very inspiring' but we did spot a couple of happy toads at it and then it was the onslaught of the din from the M40, momentarily quiet, as we went under it. The weather was holding, the rain kept off and soon we were across the open fields below Shirburn and into the top of Watlington just below the ‘Watlington White Mark’ supposedly adding height to the church if viewed from the correct position! Our stop for the night was, appropriately enough, White Mark Farm, a very nice little campsite but populated by kids doing their Duke of Edinburgh Award. We were to see more of them. Paul had, good as his word, turned up with his huge Fishing tent, our luggage and everything we would need for a comfy night including provisions for breakfast and surgically clean clothes for Nick. Cleaned up we all set off for a bit of tea. The local food pub didn’t want dogs so we set off into the depths of the countryside and came across a fantastic pub, The Half Moon at Cuxham, that did pizzas and were very dog friendly. Polly crashed out, we ate. By the time we got back it was starting to rain and the wind was getting up but Paul lit a rather splendid Norwegian log and bade us goodnight. After a very windy night and fair amount of rain we awoke to an overcast sky with a slight trace of drizzle in the air but things soon cheered up, even Nick in some smart new walking gear. Then sun came out. Jane came over and dropped our Mary off who was joining us for a couple of days. She’d already been up for hours and done about five miles getting the horses sorted. Paul was arriving later to break camp and drop our stuff off at the Bull Inn at Streatley. “No probs.” he’d said, “There’s a couple of fishing tackle shops out that way I want to go and check out.” That’s a proper pub landlord. There were the occasional long climbs but it was proper Ridgeway the beauty of which is that Polly could be off the lead most of the time. 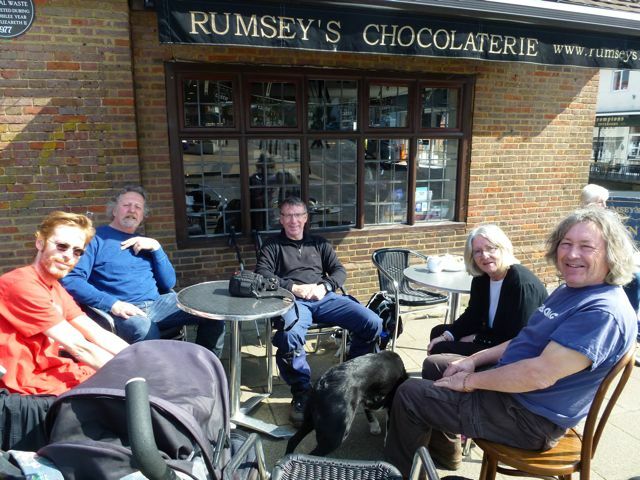 It was great having Mary along and we were a happy band that set out in search of the Thames. Religious this bit. First up was the beautiful little Saxon church at Swycombe built in the Norman period and surrounded by bluebells, then, as we came off the Nuffield Common Golf Course, where Polly put up yet another pheasant, we spotted a sign to the church that offered refreshment. Nick was reluctant but we cluttered in and behold, there was a kettle, fridge with milk, tins with biscuits and cake. It was wonderful and Polly decided the cushioned pews were spot on for a quick nap. Refreshed we did the washing up, left a donation, donned rucksacks and set off to follow the arrow straight Grims Ditch to the Thames. It is an immense structure and traces flank the Ridgeway in a couple of places. The name is common all the way back through to the Chilterns and to some extent the surviving sections could have been joined up originally. No one really knows its purpose but it probably dates from the late Iron Age. At the end you suddenly come to the Thames, turn left and follow the river to Goring passing under Brunels’ beautiful Moulsford Railway Bridge. It was here that Polly discovered that the world may be flat. She’d trotted off after some Canada geese that had moved further into the field every time she got close. Eventually, tiring of the game, they took flight and at about ten foot, flew over her heading for the river. Completely entranced she chased after, eyes focused on geese. In turn we were transfixed. These two states remained in limbo until she ran out of green and vanished into the steeply banked Thames. The Thames is not kind here and for a moment horror set in but she made it back to the bank and managed to get her front legs over the top, hanging somewhat, by which time we were there and hauled her up the rest of the way. She just stood there dripping and stared at us with that “What the’ happened there then?” look. So it was that it was four happy souls and a dripping dog that stopped at the dog friendly Perch & Pike (Paul would have approved) at South Stoke, supped ale and warmed themselves by the fire. Refreshed we set off on the last couple of miles to our overnight stop at the Bull Inn, Streatley, but not before we doffed our caps to the recently departed George Michael whose house was adorned with flowers and fan-type offering-type stuff various. The Bull is brilliant, a proper guest house come local, with a very amiable landlord and great atmosphere. It has been re-furbed in recent years and the the new incumbents are a mile away from the old ones. The locals are returning and it is now a fine, very reasonably priced eatery and watering hole. We found our host, found the rooms in which our bags had been duly dropped by Paul and adjourned to the bar to await the arrival of Jay to collect Mary who would return the next morning after sorting the horses again! As we recounted tales of the journey so far and tucked into a fine plate of grub Polly discovered an armchair in front of the fire, curled up in it, and that was the last we heard of her until it was time for bed. Stew, Polly and me got a double, double-bedded room which Polly naturally took to as soon as her tea was finished returned to her earlier state and didn’t move until the morning. Nine o’clock and Jane turned up with Mary. We should have thought about it a bit better and they could have joined us for breakfast. Apologies there. It was a lovely morning but the day was going to be pretty hard going. 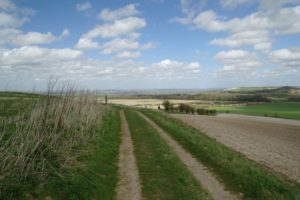 Goring is where the Ridgeway, as in open spaces, ancient clumps of trees, big skies and surprisingly easy walking, in places, starts. 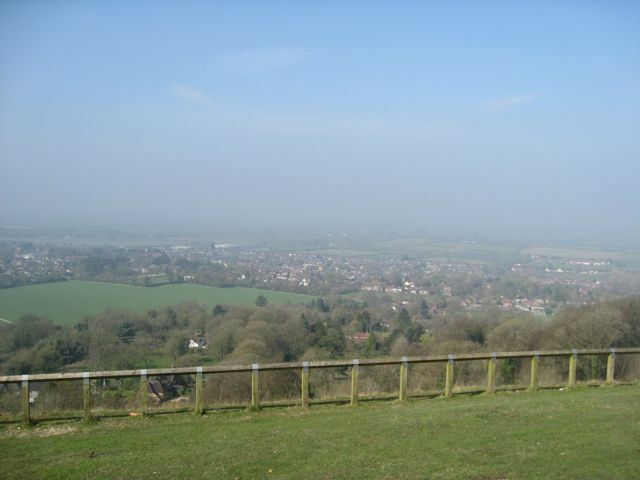 You climb out of the village and gently climb up onto the Downs’ scarp edge. It is wondrous, splendid even, and by now the real world is eons away even though we’d only been away a few days. We were detached from it. Thing is you get to see places from the other side. You have time to look and take nature in. Sometimes we walked in pairs, sometimes alone and sometimes as a group. Polly strode out between us all trying to round us up and keep us all together. There was no set pace except Nick still clicking at a steady rhythmic 3.4 mph, his satnav dingbat wotsit, telling us we’d climbed 1,000 feet. At times you wondered what you’d been thinking about but realised that you hadn’t been thinking of anything, just part of something very big. All was well. We stopped for refreshment and some of Nick’s flapjack rations which Polly quite liked. We came across the delicate memorial to Lord Wantage and took advantage of the steps to rest for a few minutes then onwards along gallops, past Segsbury Castle, a classic hillfort. Mary commented that some of the fields were bigger than their entire farm! It was on this section we first started coming across other walkers all going the otherway. 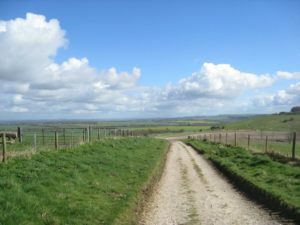 Quite a few roads cross the Ridgeway here so there are plenty of access points making local walking easier however there are no villages, settlements or much of anything, so if you want a snack you need to take your own. There are settlements at the bottom of the scarp but whereas the walk down is fine the return is decidedly uphill so we kept going despite Stewpots beer gauge showing nearly empty! Mary did brilliantly considering once again she’d been up since the crack of sparrows. On the subject of birds what was interesting to note that we were now in the company of buzzards rather then kites. Our stop for the night was Hill Barn and the sun was setting as we approached. Goodness knows how Stewpot discovered this gem as you had to actually drive down the Ridgeway to get to it. It was a Racing Stables and for £65 a head you got dinner, bed and breakfast. It was a lovely homely place. Jay was there when we arrived and duly deposited our bags. We bade Mary a fond farewell. It had been really lovely having her along. I’d miss her. It had been a long walk for sure. Our hosts, Jo and Charles, welcomed us in, showed us our rooms and invited us into a large warm and welcoming conservatory and presented us with pre-ordered Oxford Gold beers and we watched the sunset and a woodpecker from comfy chairs while Polly made friends with a small dog and then crashed out on the floor. Food would be in a hour or so, so off for a cleanup in a rolltop bath that must have held a few thousand gallons of water and was nigh on impossible to get out of. Despite a power cut, that only added to the ambience, supper was fantastic and it was three exhausted, merry souls (and a reasonably well-behaved dog) that went to bed earlier than usual! Breakfast was as impressive as supper. The electricity people had brought in a generator during the night so the power was back. The DBs, Robin and Sue Calvert Doodahs, were going to kindly pick our kit up and take it on to Ogbourne and join us for a spot of grub that evening so all we needed do was make sure we had water and a bit of grub as once again this stretch is devoid of habitation (pubs!) and head off. 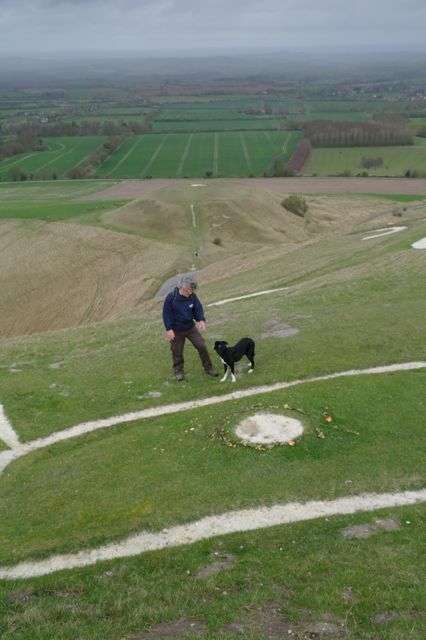 This is the bit I’d been looking forward to as we were going to meet the Uffington White Horse. All the walk from now on was magical and mystical. Forget Dorset this is Englands’ heartland. This is one of the places where you can say time is older than itself without fear of ridicule. Eyes going back thousands of years have looked across from these hills and pondered and wondered just like we do. Not much has changed really. I was saddened a little as it would have been lovely to have had Mary with us for this bit, or Alice as she’d sat on its roving eye when she was little and watched Concorde fly over. I’m very fond of the White Horse. Its very special to me. 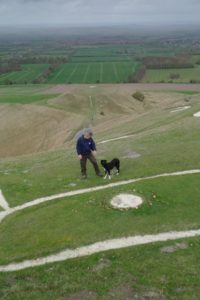 Uffington Castle and the White Horse are but a short stroll from Hill Barn. We left the Ridgeway and cut through the hillfort, a large iron age trading post no doubt, to appear above the horse, surely the most ancient of symbols. It appeared on Roman coins and probably dates from the late bronze Age or early Iron Age. It was of course as magical as expected and someone had put a posie of flowers around its eye. We spent some time just spending some time then bade it a fond farewell and headed off to check on the blacksmith at Wayland Smithy, the neolithic long barrow dating back to 3500BC and thought by the Saxons to be the home of Wayland, the God of Metalworking. I left a bit of Chiltern flint in a crevice rather than a coin, I didn't have a horse with a loose shoe, and made a wish. There is a strange air whenever you enter any of the copses or tree clumps along the ridge and this is no exception, even Polly sat down and had a perusal, before asking Nick for a bit of flapjack. It wasn’t that long before the roar of the M4 started to build. This is without doubt the most miserable and dodgy bit of the Ridgeway. Crossing it means using a very busy local road and somehow trying to stay behind the Armco and inside bridge fencing. The walkway, if that’s what you can call it is full of refuse and broken glass making having a dog a lead difficult to say the least. 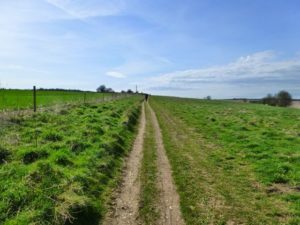 Once over you then carry on up to the Aldbourne road, cross that, and once more start climbing up towards the scarp again atop which sprawls the banks of Liddington Castle, another Iron Age settlement. This is where the flapjack incident occurred. We stopped for a drink and a ration issue when somewhere in the proceeding things got the better of Polly and when Stuart put down his last remaining bit of flapjack she nicked it! It was also around here that Stuart got a bit of a misfire on the right hand front, if I recall, which slowed his pace, and Nick pulled ahead, but after a brief stop and perusal of the beautiful, still sunny, countryside and absence of Didcot Power Station, things seemed to improve a bit and we set off once more for Ogbourne. Polly meanwhile was about a mile in front checking on Nick! If you’ve got a foot playing up it becomes a long relentless slog especially if the path is straight and featureless which it was, the views though were stunning. 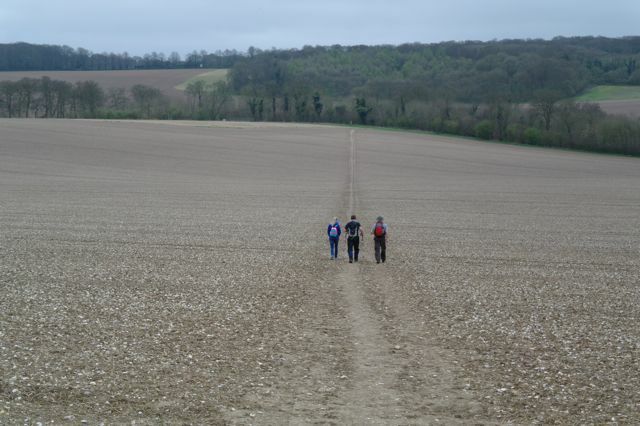 Polly returned and we called Nick, to let him know we would be a while suggesting that he walk around Ogbourne and come in from the east which would mean we could walk straight out in the morning and rejoin the Ridgeway saving a good mile and a half at least. I left a hobbling Stuart taking the first track down to the village and continued on eventually arriving at the Well-in-the-Inn (yes there is a well in the inn with a glass plate over it) a while later with Stuart and Nick supping ale (very well kept) in conversation with the Double-Barrels who had already had our luggage dumped in our room. Now, The Well does welcome dogs (no charge) and does have rooms that you can have them in but they were full. Happily a solution was found and they very kindly managed to squeeze an extra bed in a twin room suitable for dogs. Nick doesn’t do tent or room sharing, he doesn't really do walk sharing, so we decided he would need more beer. An hour later Bishy and his missus Elaine turned up, a table booked and a jovial happy band of fellows took dinner, and very nice it was to. We sat up late with some locals and finally fell in a heap around midnight, or at least Stewpot and I did. Nick spent the night trying to get away from alleged snoring which neither Stuart, Polly or I had heard, even in shared rooms! Bit broken cloudy but warm enough start to the day. Stuart’s foot was rather swollen and he was clearly suffering with it. 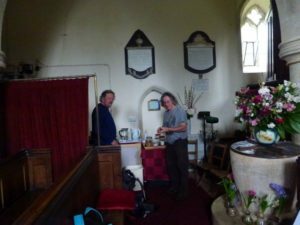 We diagnosed gout but it was probably a severe sprain as it wouldn’t really bend so we called up Jane and our taxi and arranged for him and the luggage to be collected on the way to Avebury. He was gutted as this was the last bit but it was the right decision. So it was that Nick, Polly and I left for the last leg. When we turned right out the pub and went under the by-pass it became obvious that Nick hadn’t exactly walked all the way round the village so I had to do that bit again! 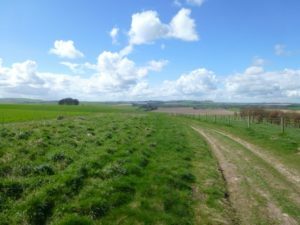 Going up onto the Downs was a bit like leaving Hall Barn in that the fabulous Barbury Castle is no distance and the whole walk is a delight along the top of the Down's scarp. We saw more people on this section than any other, probably because it was a Saturday. There were also a lot of DofE Award participants and a large group of walkers, talking about bathroom fittings and Margie’s next luncheon party with gusto, that Polly rounded up. 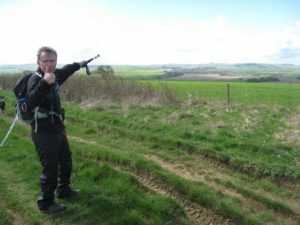 Barbury Castle is a masterpiece of banks and deep ditches and the Ridgeway actually goes smack through the middle. The closer you get to Avebury the more ancient the landscape seems with burial mounds and naturally occurring sarsen stones popping up everywhere. As you near the turn off for Avebury the Ridgeway becomes very heavily rutted thanks to some pretty heavy use by off-roaders in the past, still, a trackway is what it was and so it still is, in places. You can see Avebury from Monkton Down, even Nick seemed elated and paused from his clicking. As you get closer the excitement simply builds. We left the Ridgeway to its devices at Overton Down and joined Green Street (or Herepath), a broad, clear ancient Way that takes you through Manor Farm, a large working farm, and into the stone circle, almost stealthily, flanked on each side by steep banks and a ditch and just as we approached the sun burst out. Amazing. Its wonderful. Uplifting, and really quite emotional. Never mind the practise bit from Ivinghoe, we'd done it. 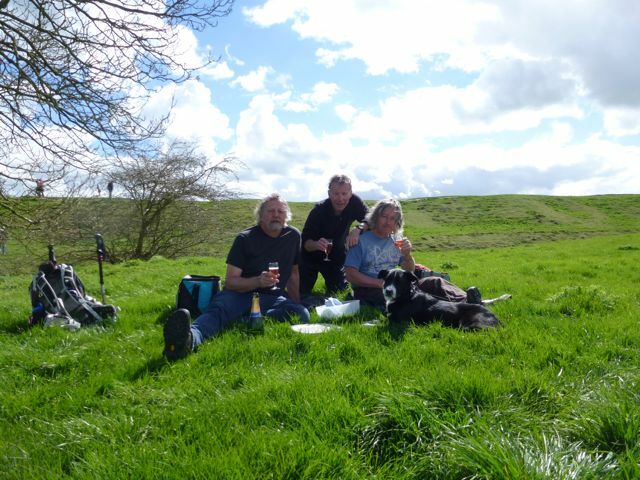 We had walked from our village to Avebury, a journey that thousands of modern day walkers have made but equally we truly walked in our ancestors footsteps and, talking of which, in a quiet place just inside the inner ditch was our welcoming party of Stuart, Jane and main man Harry the Taxi along with champagne. Sensing that this was probably it, Polly finally flopped into the lush grass. In his prep notes (like you do) Stuart wrote of the last day ‘AM. Leave kit at Ogbourne. Tour bus arrives. Camp followers tag on and off we go. Middish day arrive to Morris Dancers and dancing bears. Spread votive offerings. Light fire - sacrifice Godders. Harry takes as many as we can get in the taxi back to Ogbourne collect kit, lunch and return in triumph (or the taxi)’. Well we didn’t sacrifice Godders, even though he did start out by saying he didn’t like walking in company. We didn’t go back to Ogbourne for lunch but we did leave a votive offering in the form of large lump of flint from the fairy tree in Wendover Woods under a similar one by the inner ditch. Thing was that we had really, actually stepped out of the Swan onto the Ridgeway and walked to Avebury. Nick had recorded 92.64 miles on his satmap gadget and, amazingly, according to the thing, we had ascended up to 3500 foot a day. Incredibly I felt I could have done the same again. 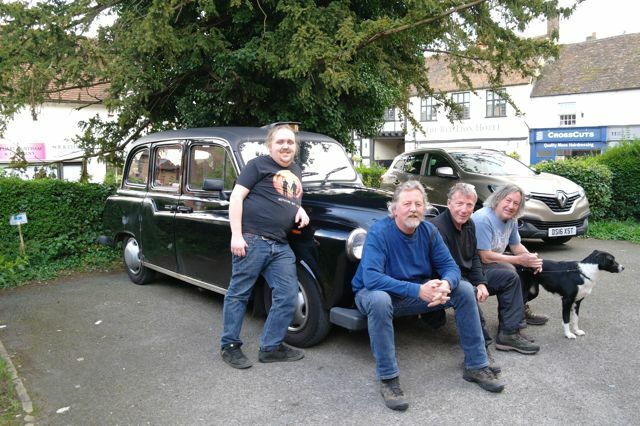 Now, when we say taxi driver we mean ‘proper taxi’ as in old London Black Cab. Harry the Taxi, Stuart’s old boy (Bucks for 'son', or 'father', depending on who you mean! ), was our wheels back. Thing about long walks is the getting back. I couldn’t imagine going back in some tin can estate car where you look at the back of somebody’s head that you have just spent the last week walking with and have to lean forward to have a conversation. Harry’s taxi was perfect, Jane and Stuart on the back seat Nick and I on the fold downs with a comatose Polly on the floor. We were a very happy bunch as we trundled back. Harry wanted to demonstrate the turning circle of his charge so we nipped into Haddenham station carpark and did an impressive pirouette before heading back to the Swan and a celebratory pint or three. A reality check could wait but it was decided that we would do the last bit again with Stuart and the first stretch with Polly. Only right really. Huge thanks to Paul, Janice, Jane, Jay, Harry the Happy, the lovely DBs and the great welcome given by our hosts wherever we stayed, especially to Polly the reasonably well-behaved collie. Well done to Mary and Simon, who did admit to have had a job walking the following day. Respect to the fairy tree for arranging the sunny warm weather (I'll fly a willow branch) and finally, big thanks to Fullers for supplying the beer that set the whole thing in motion…… Part 2 will be what happened next, be a sort of guide that may or may not be helpful and use up some of the rather lovely pics of huge landscapes we didn't use this time round. For more information on the places we used please click on the inks below.